Fr. Bill Lugger in his office at St. Casimir Catholic Church in Lansing. You may have noticed an odd set of coincidences on your calendar this year. Today is Valentine’s Day, but it also happens to be Ash Wednesday. Here’s another: Easter will fall on April Fool’s Day. This is the first time the Lenten calendar has played out this way since 1945. Today is both Valentine's Day and Ash Wednesday. 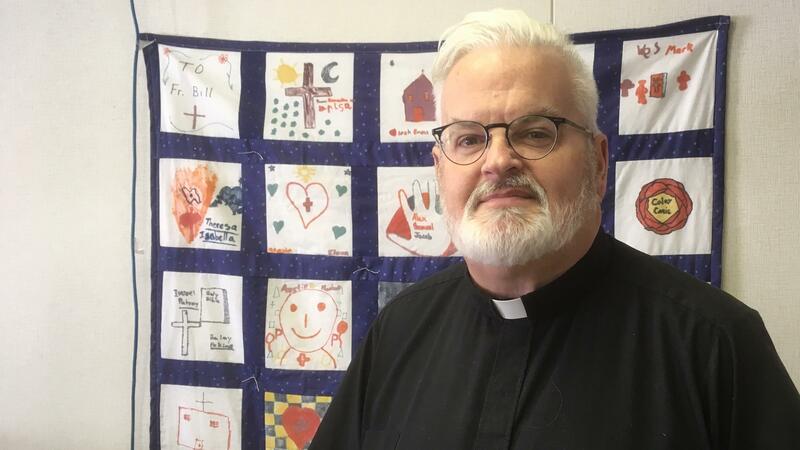 WKAR's Scott Pohl talks with Lansing priest Fr. Bill Lugger. "There is both fasting and abstinence during Lent," explains Fr. Bill Lugger, pastor at St. Casimir Parish in Lansing. "Abstinence means that you should eat one meal and two smaller meals. Abstinence also means to not eat meat on those days." Fr. Lugger continues that "fasting can be any of the 40 days during Lent." Along with fasting from food, he says it can include fasting from personal habits such as being judgmental or racist. His advice to Catholics for this Valentine's Day Ash Wednesday: send cards or flowers; maybe indulge in one piece of candy; and avoid meat. Perhaps that romantic dinner could be something like lobster. As for Easter falling on April Fool's Day, Fr. Lugger says a scripture teacher in seminary speculated that the original Easter Sunday may have happened on April Fool's Day, and that Jesus "fooled the world" by rising from the dead.